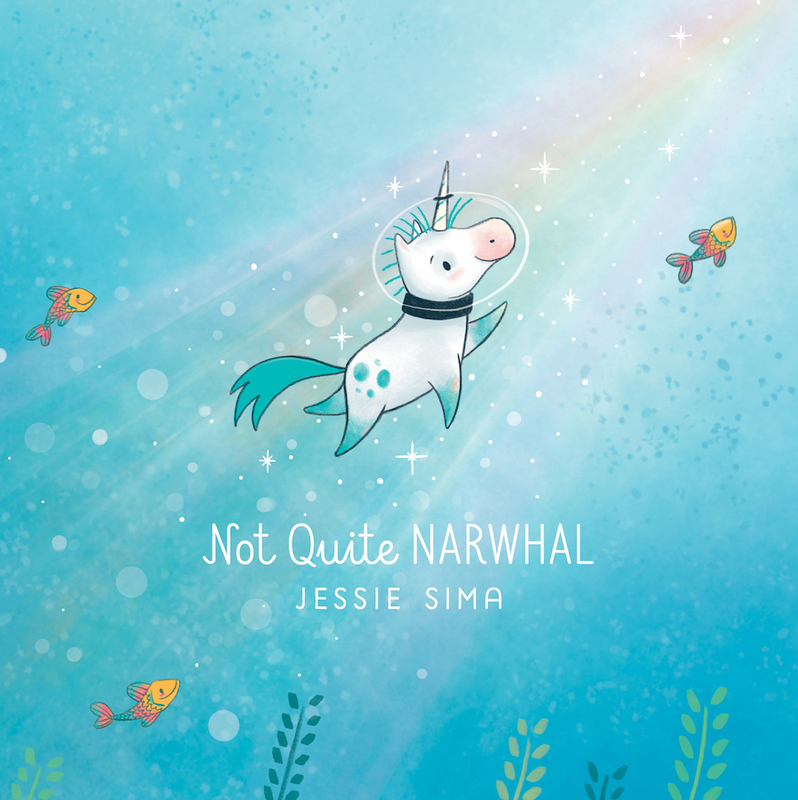 Jessie Sima joins us today for the cover reveal of her brand new picture book, Not Quite Narwhal! Click the image below to see the cover, and then read on to learn more about the inspiration behind the story. Can you tell us a little bit about NOT QUITE NARWHAL’s story? Jessie: Not Quite Narwhal is the story of Kelp, who has grown up under the ocean assuming that he’s a narwhal like all of his friends. All of that changes when he encounters some mysterious, sparkling creatures who look just like him! Now that you’ve seen the cover, it’s not really a spoiler to mention that Kelp is a unicorn. At it’s core, Not Quite Narwhal is about identity and belonging. In Kelp’s case, this means deciding for himself whether he wants to be a land narwhal with the unicorns, or a sea unicorn with the narwhals. It’s quite the conundrum. What materials did you use to make the illustrations in this story? What’s a page from the book or an excerpt from the story you’re really excited for readers to see? Jessie: There are plenty of spreads where I’ve tried to convey strong feelings of longing or happiness or a sense of belonging – but I’m going to go with a funny moment instead. A scene I’m particularly excited to share with readers is when Kelp takes his very first steps onto dry land. Kelp grew up under the ocean, so he has never had to walk before. Let’s just say – it does not go swimmingly. Was there ever a time in your life when you felt you didn’t quite fit in? Jessie: Oh, there have been many times. As an introverted kid, I often let those feelings isolate me. I let my anxiety about being different keep me from putting myself out there. As an introverted adult, I’ve realized that I’m not alone with those feelings. You’d be surprised at how many people (even those who seem very outgoing) feel like they don’t fit in! The lesson I’ve learned, and one that I hope readers take away from Kelp’s story, is that not fitting in doesn’t have to be a bad thing. If you embrace the things that make you different, you can find people who like you for who you really are. Then, instead of just fitting in for a while, you might find a place where you really belong. Thanks for sharing Not Quite Narwhal with us! Not Quite Narwhal will be on sale from Simon & Schuster Books For Young Readers beginning April 11, 2017. 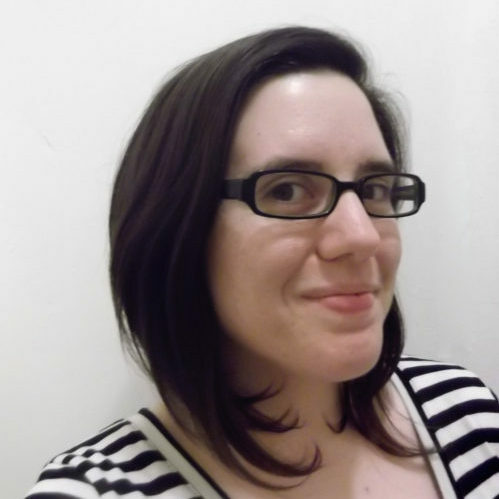 Jessie Sima is an author/illustrator living and working in New York City. She grew up in a small town in Southern New Jersey, unaware that she was a storyteller. Once she figured it out, she told her family and friends. They took it quite well. Jessie’s debut picture book, Not Quite Narwhal (Simon & Schuster BFYR), will be hitting shelves April 11, 2017. Visit her online at jessiesima.com. Adorable! I know my kids would love this.